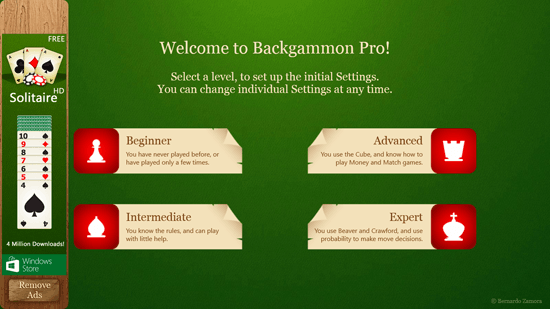 Backgammon Pro is a free strategy game for Windows 8 and 8.1 that is based on the classic strategy board game of Backgammon. A classic Backgammon game consists of a Backgammon board, two pairs of dice, a set of 15 checkers, a doubling cube and dice cups. In Backgammon Pro, there are 15 checkers for each player, there are two dices. The game is played in turns, the player one takes the turn first then the second player takes his turn. The game play is interactive with good interface, there are no delays in the movements of the checkers or the dices. It is a smooth game play with the computer and you taking turns when it comes. 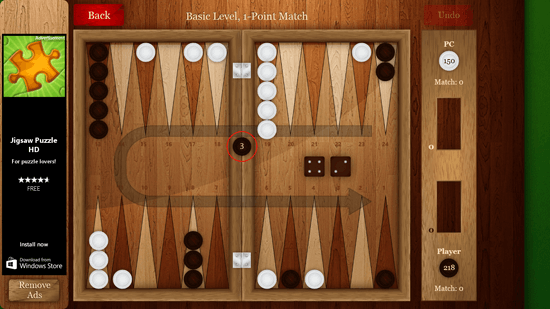 Backgammon Pro has great graphics and design. The startup page of the game impresses at first look. 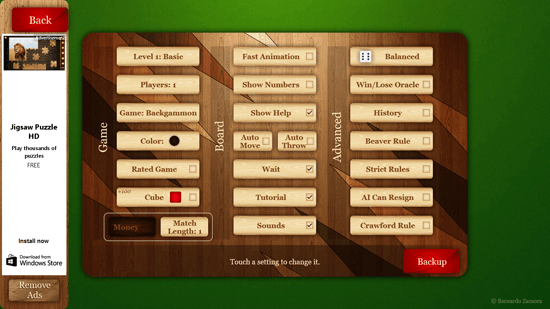 The background is textured green, over it a board of backgammon is kept to display the main menu options and buttons. The buttons also stand out from the whole background environment as they as of bright red color with texture, the color of the text is white. The settings for the game are categorized in three sections which are Game, Board and Advanced. All these categories have different options to display the game according to your wants. Before changing settings you can take a backup of the present settings so that the saved settings can be applied later as well. There are four board styles available to change. They can be accessed by clicking on the button Board colors from the main menu. You can choose the board you want to play the game on. It also changes the checkers style too along with the style of the board. You can see your position or rank among the players by clicking on Top players button where the top players are listed with their name, level and rating.